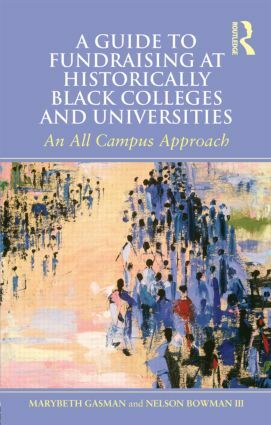 A Guide to Fundraising at Historically Black Colleges and Universities is a comprehensive, research-based work that brings the best practices and expertise of seminal professionals to the larger Black college environment and beyond. Drawing on data-driven advice from interviews with successful Black college fundraisers and private sector leaders, this book gives practitioners a comprehensive approach for moving away from out-of-date approaches to improve their institutions. An All Campus Approach—Discussion goes beyond alumni fundraising strategies to address the blended role that faculty, administrators, and advancement professionals can play to achieve fundraising success. Practical Recommendations—End-of-chapter suggestions for quick reference, as well as recommendations integrated throughout. Best Practices and Examples—Data-based content to strengthen fundraisers’ understanding of institutional advancement and alleviate uncertainties. Examples of Innovative Approaches—An entire chapter outlining successful innovative fundraising and engagement programs at various institutions. Extensive Appendices—Useful resources related to grant procurement, endowments, alumni giving, enrollment and retention, financial aid, and other helpful HBCU information. Both newcomers and seasoned professionals in the HBCU fundraising arena will benefit from the compelling recommendations offered in A Guide to Fundraising at Historically Black Colleges and Universities.